The innovative urban transitions and arid-region hydro-sustainability (iUTAH) project aims to understand coupled human and natural systems processes that affect water resources in Utah. Most of our efforts are focused on understanding biophysical processes that affect water quality in streams and rivers. This 5-year project is funded by the National Science Foundation, and supports many many collaborators across the state. 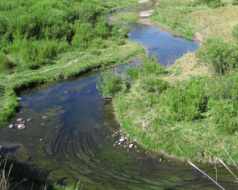 Research supporting numeric nutrient criteria and total maximum daily loads (TMDLs) for water quality protection has been sponsored by contracts from the state of Utah's Division of Water Quality. 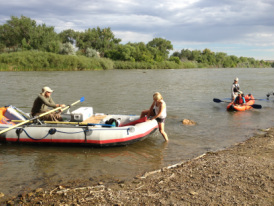 One recent project was aimed at estimating an organic matter budget on the Jordan River to better understand causes of oxygen depletion in the river. A current project funded by the Environmental Protection Agency aims to define nutrient criteria for wetlands around the Great Salt Lake. Coastal eutrophication is a worldwide problem, yet we don’t know very well how rivers transport and retain nutrients. We are using tools from small streams to understand how big rivers work in this project funded by the National Science Foundation. Bob Hall (U. Wyoming), Emma Rosi-Marshall (Cary Institute), and Jen Tank (Notre Dame) are collaborators.